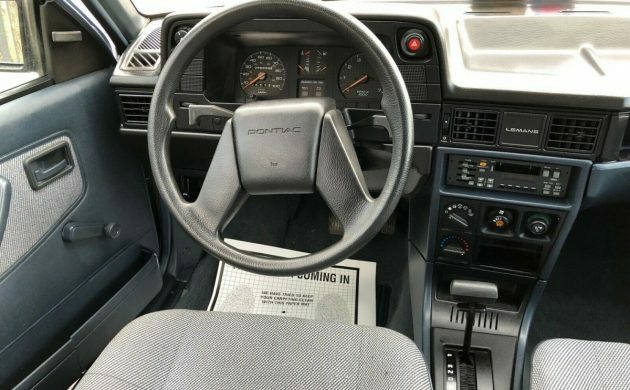 I distinctly remember the 1988 Pontiac LeMans when it came onto the market but I don’t really remember the reaction. I can’t imagine that lifelong Pontiac lovers were super enthralled with a rebadged Daewoo now wearing a Pontiac LeMans badge, but there it is. This rare-now example can be found here on eBay in Roselle, Illinois and the seller has a $6,500 buy it now price listed. GM’s soup was thick in this era, they had their hands in almost anything and everything. Before the 1988 Pontiac LeMans was born, there was already a Daewoo LeMans, which was, for the most part, a rebadged Opel Kadett. So, the Pontiac LeMans that we received for the years 1988 to 1993 was an already twice watered-down Opel Kadett. I miss the 80s! Here’s a classic 1980s commercial showing a Daewoo LeMans on YouTube. The seller has this car listed as a LeMans Aerocoupe and the Daewoo LeMans was reportedly the first aerodynamically-styled car for the Korean market. 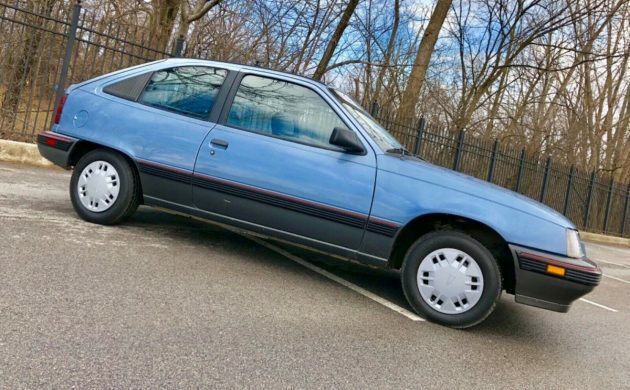 In 1986, Pontiac gave us one year and one year only of the Grand Prix 2+2 Aerocoupe and that car is quite different than this little hatchback is. But hey, both of them are Pontiacs, right? I know, I was hoping to see a 5-speed in here, too. This car does look like it’s in nice condition overall, especially the interior. Unfortunately, there are no engine photos but this car should have a GM Family 1 engine. No really, that’s what they’re known as. It sounds like something on a menu: “I’ll have a GM Family 1 engine, hold the valve stems.” It’s actually an Opel L73 1.6L inline-four with 74 hp. That was good for a Pontiac-claimed 15.5-second 0 to 60 time. 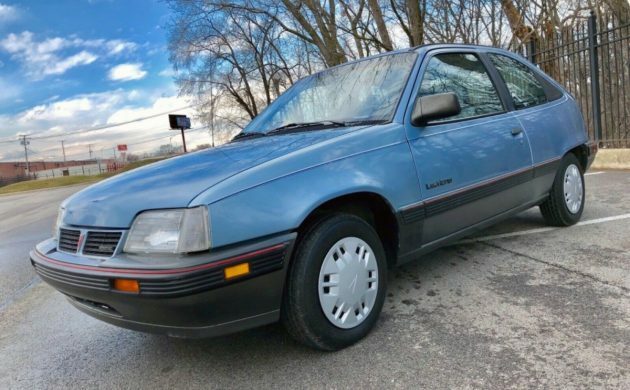 Did Pontiac jump the shark in 1988 or are you a fan of the rebadged Opel/Daewoo LeMans? My 2012 Chevy Sonic, I was told, had been assembled by Daewoo at their plant in Korea. Loved that car with a 5spd and no options other than OnStar. I think it’s safe to say the reaction was “tepid” at best to this era Lemons (whoops, Lemans). A real low point for once proud Pontiac like with the rebadged Chevettes, Vegas and Novas with slightly upscale trim. A friend had one, could have been this exact one. What an awful car. In it’s defense it was the cheapest car she she could find new- and it was plagued with problems since new. The asking price sounds kinda silly- if you drive it you will know why. When I worked at a Chevy dealer, we also had a Pontiac store when these were new. They were garbage even before they were sold. This guy is dreaming in thinking his car is worth almost what it sold for new. I would take a Yugo over this thing, and an automatic?????? Absolute bottom feeder. I worked with a young lady who lived 35 miles away in a small town. The Pontiac dealer sold her one of these crap boxes with long term financing. Not only was it unreliable, but her dealer stocked no parts. She was under 25 and couldn’t or wouldn’t rent as they waited for parts. An alternator took forever. She missed a lot of work and took a job in her home town at less money. Her used Daewoohoo was worth much less than $6500. A used domestic car would have been cheaper, more reliable, and the locals could have serviced it from the local used parts emporium. I blame the dealer. These weren’t much more than $6500 brand new. I actually drove a Kadett like this on a vacation in Germany in ‘85 or ‘86 and it was forgettable. By the time these hit the US, the design was a bit old and Korean manufacturing QC was far from where it is today. Add to that dealers who were ambivalent (at best) about the product and you had a recipe for malaise. These weren’t any worse than (and, arguably, they were better, in fact) than other 3rd world bottom feeders being sold (Yugo, Hyundai Excel, VW Fox, Ford Festiva). The word Festiva doesn’t belong in the same sentence as the others. The only thing it had in common was it was also cheap. Built like a tank compared to Fox, Excel, or LeMans. I had the Chevy equlivant. The Chevy Spectrum. It was the first new car I bought off the lot at the age of 16 with my parents help. It was a great little crap box and I mean that in a good way. I hit 150k miles before I sold it to a guy for 500 bucks. I will say living in Ohio at the time, I had no rust issues. Only major issue was the cable clutch pulled thru the firewall. Welded firewall up with new guide, installed new cable and it was ready to go. jrw27288, please don’t compare the Spectrum to the LeMans. There is no way you can compare an Isuzu to a Daewoo. They are not even in the same universe. I wouldn’t pay $650 even if it had only 1 mile on it. Complete garbage that you would be unable to find parts for. What is it about this shape that fascinated Pontiac so much? Look at it in profile next to an Aztek. Y’all should check out the Motorweek review on these when they first came out. I love their reviews on ‘80s econoboxes that are rarely heard of or seen. Always figured that the marketing people slapped the LeMans name on these to avoid the costs associated with registering a new name. Also figured there were plenty of people outside of the marketing department who weren’t happy with that decision. I examined one at the LA Auto Show when these came out. I thought it was insanely narrow inside and the doors and sheet metal really thin. Thin gruel. GM’s lack of ability in building small cars had them hooking up with Suzuki, Isuzu, Opel, Daewoo and Toyota during the 80s. [Did I miss any?]. I think primarily because GM has never, ever wanted to sell small cars. Just large ones and trucks. Until now ultimately, only trucks. Not surprising they ceded any homegrown ability to Germany and South Korea. Ford the same: they won’t be satisfied till everyone has thirty year loans on Excursions. A similar model that looked just like this was produced in the UK by Vauxhall which was GMs UK branch. The were known as the Vauxhall Astra and may have been the original design. Available with different engine options and in 2 and 4 door configurations. My wife had an Astra GTE Convertible which had a 2.0 fuel injected with a 5 speed. It was fast, comfortable and easily pulled a 16ft travel trailer. Great cars but obviously not the same as the Daewoo/Pontiac model offered in the USA. 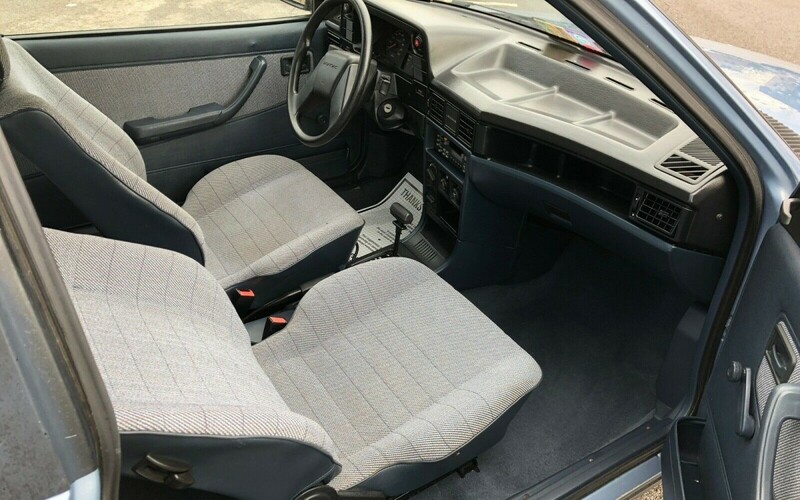 There are a lot of relatively pedestrian cars from the 80’s that weren’t considered as all that special at the time, but get a smile now from gearheads when they come across one. You know what I mean. Cars that were in some way interesting. Had personality and character even if they weren’t scorchingly fast. Mazda MX3. Nissan NX2000. Nissan 200SX. Ford Probe. Subaru SVX or XT (or any Subaru of that vintage for that matter). Nissan Sentra SE-R. Honda Accord and Civic. Toyota Celica. Mitsubishi Cordia (when did you last see one of those)? Even marginal beasts like the Chrysler Laser and Dodge Challenger/ Plymouth Sapporo. This car isn’t one of those. Aye, you’re right. This was originally the Opel Kadett/Vauxhall Astra. This shape is 1985 (-ish?) onwards and is the second body shape (the first one was introduced as a successor to the Vauxhall Chevette in 180/81, I think). GM USA must given it the ugly bumper treatment for your delectation! Daewoo must’ve taken what was by then an older model to save on design costs. One of my mates loves Astras and has done big mileages in them with very few issues. They have a good reputation. back in the mid 80’s? Add three handles to each side and you won’t have to buy a coffin when you get into an accident with this thing. Poor quality control. Opel had the quality but it did not translate too well to South Korea where somehow the quality got lost in translation. I convinced my friends girlfriend to get one. She did, in two months it was in the shop three times! A week later they were in the middle of a chain reaction accident on I-91 in Connecticut where it was totaled but they were luckily unscathed. Well I was glad to walk into the Barn Finds’ bathroom, open the toilet lid, and find this little turd floating around at the top. Make fun of it all we want to. I bet this gets more comments than any other car this week! Pontiac made a hot version of this called the GSE. Using “hot” in the most relative possible sense. A junkyard I used to go to in the late 1990s had a GSE, so that’s the only reason I even know it existed. Amazing this is still around. They didn’t usually last very long given the nature of their buyers and relatively cheap build quality. EU market had a GSI version of these Opel Kadet. 8 valves version with 130 bhp and 16 valves with 160 bhp. 2 liter if I recall well. These cars were light and fast. A lot of torque steer with the 16v version though. A friend of mine had a 130 bhp. Went for a drive and this WAS fast. I found the build quality satisfying and it handled not so bad even if I preferred RWD for a sports car. Had one of these new, the 4 dr. With auto and a/c I put 165,000 mi on it, original engine and trans., it was cheap to run. And maintain. Sold it to a friend who kept it another 2 years before it finally died. Just like the 3 Opels I had, you either love them, tolerate them or hate them. They got me there and back. Basic, fun, economic transportation. Pontiac dusted off some old names and applied them to some pretty blah cars around this time, this was probably the worst, with the Canadian only Pontiac Tempest aka Chevrolet Corsica with an Pontiac emblem being probably the 2nd worst and the fairly lame but at least still a V8 Pontiac 2+2 nee Grand Prix with a big rear window was the least offensive. There was kind of a rush in the later half of he 80’s for “real cheap” cars after the introduction of the Yugo in 1986 and some looming recession fears lead to cars like the Hyundai Excel, VW Fox, this heap, Chevrolet Sprints/Metros and the Festiva along with stripper versions regular cars like Mopars “America” series of Aires, Omnis and Sundance/Shadow cars and Pony Escorts all coming to market as a hedge against future economic doom. GM’s small car planning in the 80’s was like a kitchen with 30 chefs speaking different languages and no one talks to anyone else. This Kadett really should have been the replacement for the aged Chevette around the time they first came out in the early 80’s, but then GM got into bed with Suzuki and birthed the Chevrolet Sprint, which was sold alongside the 1976 era Chevette for 2 years along with the Spectrum, a re-badged Isuzu IMark from GM’s other distant Japanese on and off girlfriend. 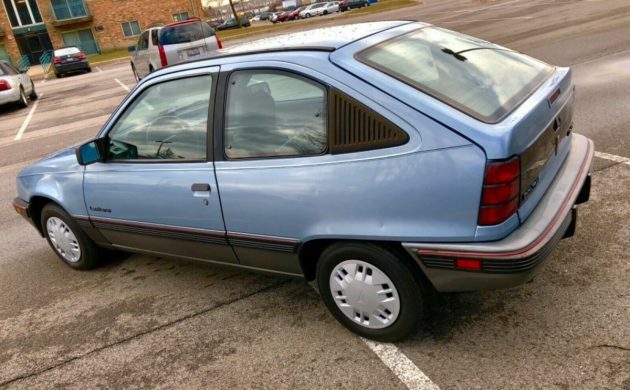 Why Pontiac didn’t just get a version of those like it did with the T1000/Chevette? Who knows? Pontiac did get Sprints and Metros in Canada as Fireflys. The Kimchee LeMans was also sold in Canadia under the “Passport” brand too, which was like Geo for Candian Pontiac-Buick dealers, or something? maybe? I imagine the Kadett was delayed by some “NIH” syndrome and probably because it wasn’t a cost efficient proposal to actually produce the Kadett in the US at the cost it was going to sold at, around Chevette prices, which probably explains why it was farmed out ot Daewoo, by the time it made it to the US it was dated and lots of zee German-ness was lost in translation. As a further note, while all this hodgepodge was going on, GM was also creating Saturn too……….. Interesting all the comments about how bad these were. Back in college (late 90’s) I had a girlfriend who had one of these, same color and everything, but the GSE (“sporty”) model. Never had an issue with it. Not one. Drove it all over Montana for a couple of years. She finally traded it for a 74 (I think) VW Formula Vee Bug. Made the mistake in 1990 (young, dumb and limited funds) buying a Lemans LE 4 door. In 6-mos and 2,000 miles nearly everything broke or fell off of it and it kept overheating. Finally bit the bullet and got rid of it for a Geo Storm…. What a horrible POS the LeMans was!!! !